You may be familiar with the Bike Cleaner produced by CYKO™... but there has been a major design change to the bottle and the trigger spray! 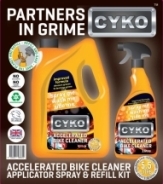 CYKO™ Accelerated Bike Cleaner works equally well on motorbikes, mountain bikes and anything else with two wheels (P.S. trike lovers - CYKO™ loves you too!). This awesome motorcycle cleaner is safe to use on EVERY part of your bike, from chrome to rubber, aluminium to leather, engine to frame, top to toe! For best results, pre-wet your bike, apply CYKO™ Accelerated Bike Cleaner liberally and leave for 3 - 4 minutes. Tickle any particularly awkward grime with your favourite brush & then rinse off with fresh clean water.